Recorded live at Warren Haynes’ 18th Annual Christmas Jam in Asheville, NC on December 16th, 2006 at the Thomas Wolfe Auditorium, The Benefit Concert Volume 8 is the third release in an on-going series documenting the annual concerts. As with each previous benefit, all proceeds from this series of concerts and CD and DVD releases benefit Habitat For Humanity, an international non-profit organization dedicated to building housing for those in need of shelter. The 2006 concert saw Warren Haynes put together a stellar lineup of musicians featuring Gov’t Mule, Dave Matthews, The New Orleans Social Club, Marty Stuart and His Fabulous Superlatives, The Taj Mahal Trio and The John Popper Project featuring DJ Logic. 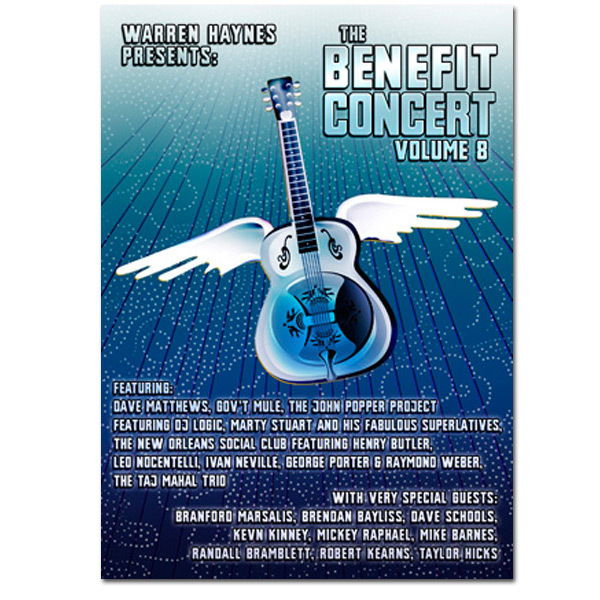 Warren Haynes also welcomed very special guests Randall Bramblett, Taylor Hicks, Branford Marsalis, Mike Barnes, Mickey Raphael (Willie Nelson & Family), Brendan Bayliss (Umphrey’s McGee), Kevn Kinney (Drivin N Cryin), Robert Kearns (The Bottle Rockets) and Dave Schools (Widespread Panic). The Benefit Concert Volume 8 offers more than 3 hours of incredible music from The New Orleans Social Club’s version of Creedence Clearwater Revival’s “Fortunate Son” featuring Branford Marsalis to Gov’t Mule and Dave Mathews’ scorching cover of Neil Young’s “Cortez The Killer” to the all-star “I Shall Be Released” finale. Click on product image for DVD chapter list.